This Sculpture Garden inside the Metropolitan Museum of Art in New York City is a beautiful and peaceful space – perfect for any traveler. I’ve been meaning to write for some time about why every trip should include art museums. But when I read Robert Reid’s post “Are Museums Overrated?” on National Geographic’s blog, I knew it was time. In his piece, Reid argues that Museums don’t necessarily need to be on anyone’s “To See” list – unless of course that’s your thing. I would encourage the opposite! Even if you’ve never been to a museum in your own community, you must visit museums when traveling. Most travelers are skeptical about spending precious vacation hours looking at old stuff, so let me tackle some of the mental barriers for visiting museums and elaborate on the major pluses for this cultural experience. 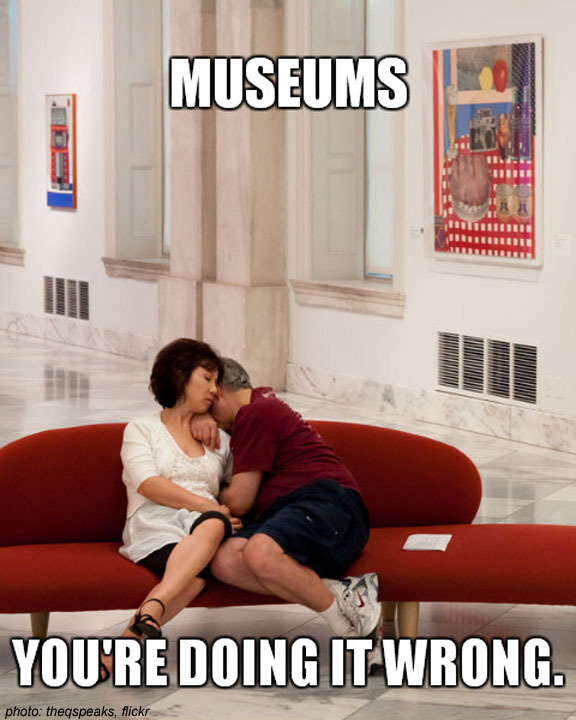 I think just made the first “museums wrong” meme, but you could probably think of lots of other examples of visitors not getting it right at a museum. Maybe your biggest complaint about visiting museums is the tedious experience of actually visiting a museum. I see this at every one I visit: slowly moving herds of people filing by pieces, doing a once over look and maybe snapping a picture. Galleries are somber and visitors take on a checklist attitude feeling obligated to meander through every space. Digital cameras & smartphones have even made the experience even more unbearable at times. This is not how you visit a museum. The recent “quality travel” movement advocates a deep dive into local culture for a more complete and enriching experience. It’s the same thing with museums. Always err on the side of quality versus quantity. I’ve spent a full day in the Louvre, one of the most incredible museums in the world, but I didn’t come close to seeing everything. And I’m a self-proclaimed “Art Traveler”! It distracts from the quality of the art to pretend you are going to see it all because really, how much time does that leave you with any one piece? Will you really notice any subtly in the characters, emotion, or its execution if you give each a passing glance? Imagine yourself in Venice. You might wander some of the streets then sit to watch life along the canal. You would never force yourself to march your way through all of Venice’s streets “because you have to see it all”. It’s the same thing in museums – just look for things you like or don’t like and most importantly make the experience your own and enjoy it. I sometimes wonder if it is the price of museums that makes people feel obligated to see everything. Most major international museums are $20+ which is not cheap for budget travelers. Again, this is not a buffet where you need to eat as much food as possible for your money. You ordered the filet mignon and it taste like Northern Renaissance Art so savor it and don’t worry if you don’t eat the baked potato that came on the side! One of these painting caused a major scandal in the Paris art world. Would you have know this walking through the galleries? Most people prepare for travel by pouring over guidebooks, reading blogs, and talking to friends about a destination. We do our homework and set off knowing the best local dishes, most beautiful city walks, and quintessential local markets. But why doesn’t anyone do research about art? We take it for granted that the museum will enrich us without even considering what we might want to see while we are there. Why write off a museum if you yourself don’t know what’s worth seeing in it? Luckily more and more art museums are getting savy digitally and have special suggested tours, collection highlight lists, and interactive features on-line to make planning your visit easy. Many places connect the pieces to larger events in history and national culture so you understand the context and importance of a piece. Granted art is not everyone’s expertise, so maybe you decided to leave the planning to the experts. If you find yourself in a museum without any background knowledge, then take advantage of the curator tours, guides, and other written material provided for visitors. 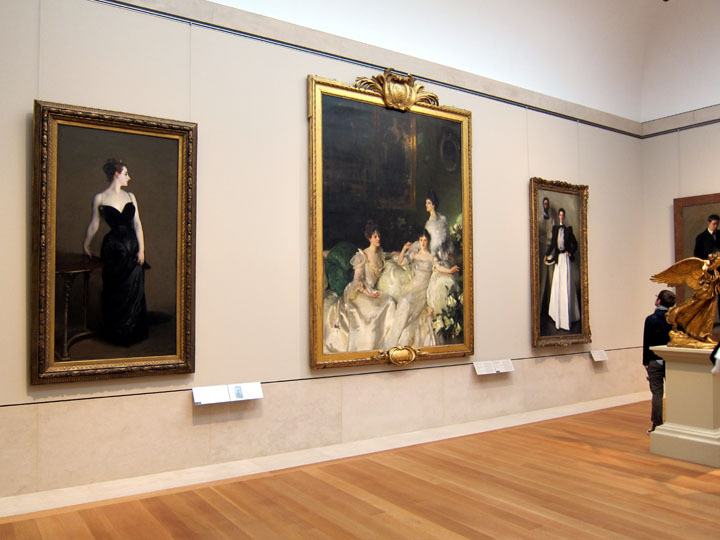 For example, John Singer Sargent’s Madame X at the Metropolitan Museum of Art might just look like a fancy lady and you’d move on past it. But on a tour, you’d hear about the scandalous history of this “indecent” piece and how Sargent had to repaint her shoulder strap after a public outrage. Without realizing it, you could have walked by one of the most fantastic paintings of the Parisian art world at the turn of the century! We’ve got TV, movies, and the Internet, but our ancestors had art. Religious paintings elevated, transfixed and terrified worshipers in Europe for centuries. Images and objects conveyed royal power everywhere from China to Peru. Folk art captured the hopes and memories of common people. Art is emotional. It has power and drama, pain and pathos. Sauntering past a painting, you don’t give it enough time to open up. Have you ever really looked at a work of art? Part of “art appreciation” is trying to understand the meaning and purpose of a piece. Sure, some painting may seem cryptic and complex, but sometimes, like in Goya’s The Fifth of May or Matthias Grünewald’s Isenheim Altarpiece, the impact is immediate and visceral. If you want to understand a little bit more about the power of art, one of the most compelling, personal stories about the emotion and importance of art comes from Monica Bowen (of Alberti’s Window) and was published on the late Hasan Niyazi’s ThreePipeProblem. Monica was so moved that she is now a professor of art history, but you certainly don’t have to be a professional to connect with a work of art. I’m excited about the local culture and slow travel movement. I think every tourist should be looking for authentic experiences. But on some level, you need to understand a culture’s past before you can appreciate its modern psyche. Every village and city has a past that formed the buildings, people, and ways of that community. Art is how humans have been recording their triumphs, hopes, and tragedies for centuries. It is important to see who a people once were in order to understand them today. 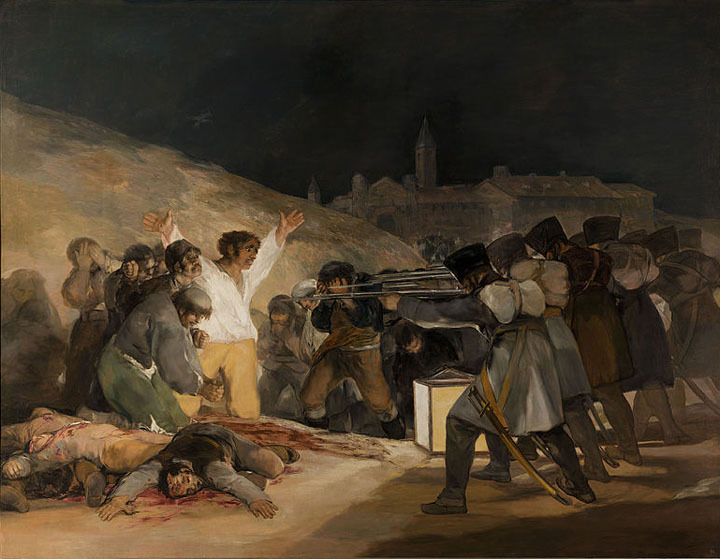 For example, I think it enriches your visit to the Puerta del Sol Square in Madrid if you’ve seen Goya’s The Third of May. If you understand that Chinese art changed little over a thousand year period, you might have something to ponder among the ultra new skyscrapers of Shanghai. Even the Acropolis Museum in Athens sheds some light Greece’s long history of occupation and eventual independence. Who knows what new insight you may find! I also find it interesting to see how a culture presents its past both figuratively and literally. The new Rijksmuseum in Amsterdam is not just an art museum. It tells the nautical, merchant history of this small nation through maps, ship models, and other exciting objects picked up in their travel. It’s a far more detailed and nuanced story than I ever learned in school but it is told with care by the museum about the nation’s ancestors. The museum itself which incorporates historic and modern architectural elements and it both practical, inviting and open seems to also mimic for many how the Dutch see themselves today. 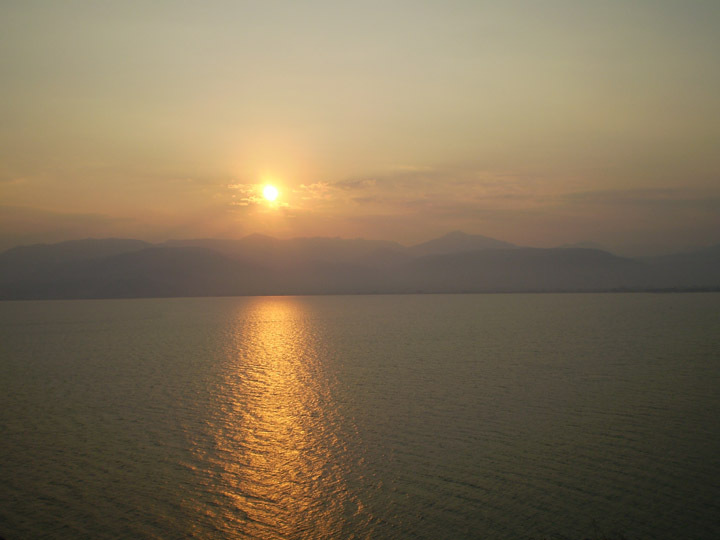 The sunsets are humblingly beautiful from the hills around Nafplio, Greece. This is just one of many unmissable travel experiences. Travel itself is a challenge. We leave our community and our comfort zone because we want new experiences. Maybe you don’t eat horse meat at home, but when you’re in Amsterdam, why not try it? Maybe you don’t watch a lot of sunrises at home, but you are definitely going to wake up for them in Thailand. I am not a “beach person”, but I just got back from Tel Aviv and its incredible beach boardwalk. We travel to see new things. If you don’t consider yourself a museum person, at least give it a try. For the reasons I’ve mentioned above, you should at least give yourself the opportunity to learn something or be moved by art. Museums can really enrich travel and are a critical part of exploring and understanding new places. You should see the massive Louvre in Paris, or the tiny Desmond Castle Museum in Kinsale Ireland. But most importantly, be conscious of why you are visiting and how you are visiting any museum. Your approach, attitude, and choices can have a huge impact on your experience. Ultimately, I agree with Reid that we should not have a “checklist” mentality when it comes to museums. But then again, travel should never be about checklists. You should never do something just “to do it.” If there is anything that is truly over-rated about travel, it is not thinking about why or how we travel. A very interesting article on why you should visit museums. Even if it’s not your style, look into a tour or history of the display. There is more to be learned than just what the brochure says! The world is irremediably going this way, but as long as a few art lovers survive, let the insensitive travellers go canoeing and playing hockey with Mr. Reid. Museums are paradises for the mind, especially when there are no bored cell phone zombies walking around (the first picture in Mr. Reid’s post is a clear statement of principles at this regard). Superb post, Picassian Christina. Thank you for trying to make the world a better place … but when such a truly admired institution like National Geographic publishes such a disheartening post, I am afraid that the battle is lost. Thank you Covetotop! I try to encourage travelers to indulge in artistic and historical sights when traveling. 🙂 I think museums will always be important and appreciated. Sometimes we just need to be reminded how to approach them. The expectation should not be “okay entertain me now museum,” but one of exploration and self-guided learning. Interestingly, National Geographic has a pretty nice museum here in DC. I can’t go exploring in the Amazon or undersea with their photographers so its a good place to learn about their adventures. I could not agree more. Eat, drink, and visit museums is a formula for successful travel. I really love this article, Christina, I think you totally nailed it, explained what seeing art should be about. Actually, your ideas could also be applied to many other areas when I think about it; when you take your time to understand something in its context it all becomes so much more interesting, even if it’s something not necessarily beautiful at first glance, or even too complex. I’m sure I’ll remember this post for a long-long time. Well done :-). Museums are great and we go often but I’ve often felt like the guy in the second picture. I’m not a big museum person but I do feel guilty when I don’t go to one on a trip. Often times it’s the huge lines and expensive admission price – when I was in Paris for 2 days I skipped the Louvre because I didn’t want to spend so much time waiting in that line! I try to find an exhibit that interests me, usually something to do with fashion or photography. I think that’s totally reasonable! Waiting in line is no fun! If you can’t get tickets online or ahead of time, it’s fun to explore small museums instead, especially small museums focused on your particular interests. Photo snappers drive me nuts too. Great post! Can you expand on what makes you nuts here? I often take photos in Museums and I do try to avoid obnoxious behavior. I think it’s the mindless photo snappers that drive people nuts. We’ve all seen that person who doesn’t even stop to frame their photo properly – they just take the picture to take it and move on. I definitely take photos in museums (when allowed). I am always conscious of the people around me and make sure to take my time looking at the work too. I completely agree! I try to visit at least one museum in every new place I visit. They hold a wealth of information about the culture and history which to me is crucial to understanding what makes each place special. 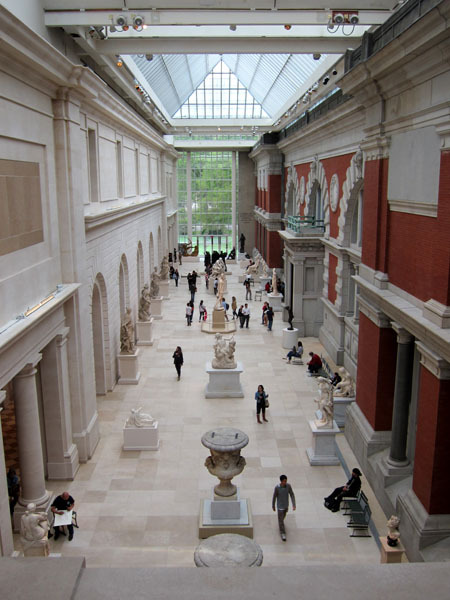 Ooh, a great photo of one of my favorite places–the Met’s American wing. You are absolutely right that most people ‘do’ museums wrong. It’s incredible to me that people commit a huge sum of money towards their flight, hotel, etc. and then balk at investing in a good guidebook or a museum entrance fee. People these days are so bored and ‘meh’. Art takes you out of that. I fit in even the biggest museums into my travel schedule by going to the museum website and looking at their collection for a few minutes. Then, if hubby or son only wants to commit an hour or two there, we see the highlights. Then they thank me. My life was completely redirected after I saw Manet’s Olympia. It’s worth $20 to see something real (not a reproduction) that just might change your life. This article perfectly encapsulates what I’ve been thinking lately about visiting museums (and then some!). I’ve recently moved to Melbourne, from Brisbane, and having the National Gallery of Victoria so close to home, and free to visit, has completely changed my relationship with museums. I’ve always had a strong interest in art and history, but my experience of the Louvre fell flat compared to my time at Musee de l’Orangerie, Musee D’Orsay, Musee de Moyen Age and a few other small(er) museums around Europe that I loved. It turned me off bigger museums entirely. 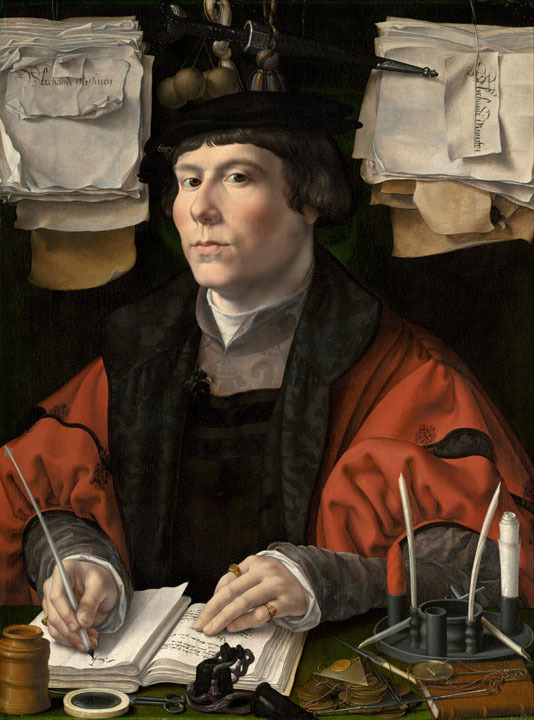 In the times since I’ve been to Paris, I haven’t returned to the Louvre, but next time I will – one of the biggest blocks, which you addressed, is thinking you have to get your money’s worth, which leads to a check-list mentality! Or also over-staying and burning yourself out, because if you waited for an hour to get in, you feel you need to spend a loooong time there. Visiting the NGV for free (something like five or six times in about two months, it’s my favourite way to relax now!) has taught me how to “follow my nose” and not try to see everything, instead picking one collection, or a few different pieces from a few collections, and just enjoying them. Great piece, I wish I’d found it sooner!